Beatrice Gormley - Back to Paul Revere! 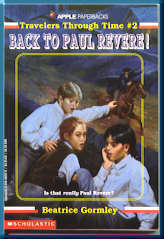 Buy "Back to Paul Revere"
I visited Lexington and Concord, Massachusetts, to research this book. The village green in Lexington looks much the way it did in 1775. So does the bridge in Concord (although it's been rebuilt). They're about to join the American Revolution! from Back to Paul Revere! Chapter 8, "A Fire in Concord"
Marching at the rear of the ranks of minutemen, Jonathan watched the arch of the wooden bridge loom closer. The redcoats, who had been trying to tear up the planks of the bridge, stopped what they were doing and crowded onto the far end. Jonathan gasped at the shots, flinching as if he'd been hit. Then he saw the splashes in the river - the British had fired warning shots. A breeze pulled wisps of musket smoke downstream. The drum beat steadily. The men in brown and gray closed the distance to the bridge. Jonathan, at the heels of the last unit, wondered if his gun was loaded.